In 2014, there's a lot of good things going for emerging talent. On Friday, LVMH announced that 30 semi-finalists in its first-ever Prize for Young Fashion Designers will meet with a panel of 40 fashion experts during Paris Fashion Week to review their submissions. (Which are due Feb. 2, so you still have time to apply if you were thinking about it.) Those experts -- including Dover Street Market CEO Adrian Joffe, Net-a-Porter CEO Natalie Massenet and Style.com Editor at Large Tim Blanks -- will then select 10 finalists, who will present their collections in May to a jury that includes Marc Jacobs, Phoebe Philo and Nicolas Ghesquière. The winner will receive 300,000 euros, as well as a year of help from LVMH. "This support will include all crucial areas of expertise that are critical to successfully building a nascent fashion brand, including advisement on intellectual property, sourcing, production and distribution, image and advertising, marketing, etc.," LVMH says in a release. The benefits to LVMH launching a fund like this are great. Not only is it an easy way to generate positive press and the right kind of buzz, it&apos;s also a way for the luxury conglomerate to create its own sort of international fashion incubator. Investing in Maxime Simoens and J.W. Anderson (the latter of whom was also brought on to lead Spanish leather house Loewe) prove that they&apos;re serious about young talent and ensuring that young talent contributes to the future of LVMH, both creatively and financially. But it&apos;s also a boon to young designers. Think about it: 300,000 euros, and a year of advice from one of the most important companies in the world? Those kinds of opportunities don&apos;t surface every day. First, let&apos;s consider the funds. 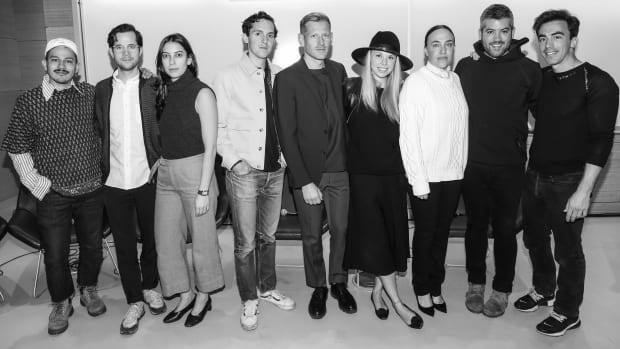 There&apos;s the CFDA/Vogue Fashion Fund for young American designers. The Dorchester Collection Fashion Prize, which is based in the UK but accepts applications from designers across the globe. The International Woolmark Prize, which holds smaller competitions in different regions of the world before bringing those finalists together. The CFDA&apos;s Swarovski Award, which supports emerging American designers. The ANDAM Award, which is open to designers the world over. Elle&apos;s Fashion|Next competition, which awards American college students. The Ecco Domani Fashion Foundation Award, which also supports emerging American designers. The Hyères Festival competition, which welcomes designers from across the globe. The British Fashion Count/British Vogue Fashion Fund, which awards a young British designer each year. And French Elle&apos;s Aime la Mode in Paris, which supports young French designers. The list goes on, but you get it. Add to that the scholarships offered by organizations like the CFDA, Kering, LVMH and the British Fashion Council to design students. There are elevated internship opportunities, too, like Kering and Vogue Italia&apos;s Empower Talents program, which offers internships to design students at Italian fashion houses. And let&apos;s not forget the proliferation of fashion education. Along with the dozens of fine schools across the globe that teach fashion design (see Fashionista&apos;s picks for the top 50 here), there are one-off classes for designers at every career stage. Fashion Business Accelerator 360, for instance, offers both online courses and in-person workshops on everything from branding to raising capital. And in Paris in 2012, the Federation Française de la Couture and the Chambre Syndicale launched a four-year, business-focused fashion course for those who may want to master their finances. While not every single bit of education out there is going to be beneficial, the good news is that there are lots of options. Opportunities to show at Fashion Weeks are increasing, too. Along with Made at Milk in the U.S., which provides free show spaces to up and comers during NYFW, Topshop offers similar support to emerging designers at London Fashion Week. In London, there&apos;s also the Topshop-sponsored Fashion East, a non-profit founded by industry insider Lulu Kennedy that offers three womenswear and three menswear designers the opportunity to present a runway collection. (Lots of great designers have come out of Fashion East, including Gareth Pugh and Jonathan Saunders.) And in Italy, where the emergence of a new group of interesting designers has garnered quite a lot of press over the past year, more efforts are being made to accommodate their needs. In many cases, stalwarts are using their influence to trumpet what&apos;s next. During the Spring 2014 Milan shows, Giorgio Armani lent out his show space to buzzy designer Stella Jean, and Dolce & Gabbana opened a Milan boutique that stocks emerging talent including Fausto Puglisi and MGSM. Most recently, the Italian Chamber of Fashion appointed a new CEO, Jane Reeve, who has said that one of her main objectives is making it easier for young designers to get exposure at MFW. Of course, designers today are up against more competition than ever before. But as fashion&apos;s financial footprint grows, more people, companies and even whole industries are going to want to support those who are at the core of its existence. Because actually selling clothes is never a bad thing.